Here's a CNN clip of Oprah and Obama. "Over the years, I have voted for as many Republicans as I have Democrats," Winfrey said — one line that didn't draw applause in the partisan crowd. "This isn't about partisanship for me. This is very, very personal. I'm here because of my personal conviction about Barack Obama and what I know he can do for America." "You want Oprah as vice president?" he asked the crowd that responded with enthusiastic cheers. "That would be a demotion, you understand that?" The Obama campaign gave out 23,00 tickets to the event. It said 18,500 people attended. 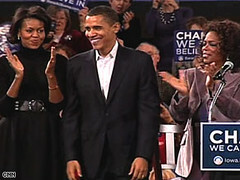 Obama spoke after Winfrey, and acknowledged that he was under no illusions that the crowd was there to hear him. Indeed, some people left during his speech, although the majority stuck around to hear him.